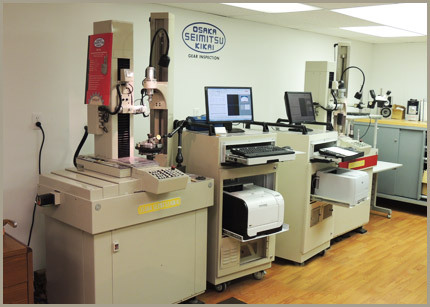 All gear honing machines are now in our Chesterfield, Michigan facility and are fully operational and ready to serve you. 1. Improve the sound quality of shaved, hardened gears by removing nicks and burrs; and making minor improvements in involute, lead, tooth spacing, P.D. runout and surface finish. 2. Prolong wear life and increase load-carrying capacity of ground, hardened gears by improving surface finish to a point where up to 80-percent of surface contact can be achieved with the mating gear. 3. Salvage hardened gears with oversize teeth, runout from excessive heat treat; distortion, or damaged or nicked teeth. 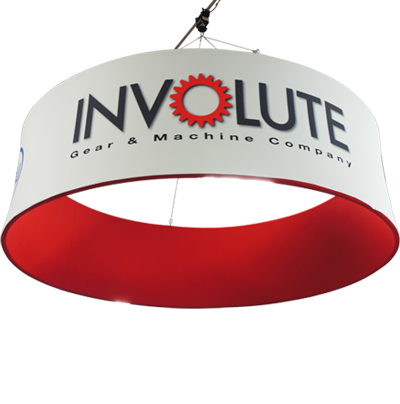 The gear honing process uses abrasive-impregnated honing tools in the form of a helical gear. These tools are made with a variety of abrasive grits in two honing types and one polishing type to produce surface finishes down to the 4 to 6-mu range. The tools are mounted on special honing machines in crossed-axes, controlled-mesh relationship with the gear to be honed. 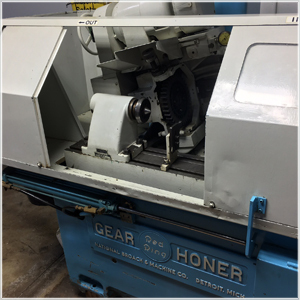 During the honing cycle, the work gear is run with the honing cycle, the work gear is run with the honing tool at speeds of approximately 600-ft. per minute. The honing tool is traversed back and forth across the gear face, and direction of rotation of the honing tool is reversed at each end of the stroke. Particles removed by honing are carried away with conventional honing oil. Four different methods are used to apply pressure between the work and honing tool, which normally should not exceed 40-lb. The honing machines are equipped with tilting table or air feed arrangements which can be either locked in position to provide a pressure control method, or pressurized with and air cylinder to provide a constant-pressure method. IMPROVEMENT IN TOOTH ACCURACY achieved by honing a shaved, helical truck transmission gear shown at the top of the chart. 1. Zero Backlash with Constant Pressure. 2. Loose Backlash (often used with internal gears with braking on one axis). 3. Zero Backlash with Loose-Locked Overload Relief. 4. Zero Backlash with Heavy Lock. In salvaging operations, the amount of honing should be limited, and stock removal should be done slowly. Gears with crowned teeth can be honed by either method. The work table on the honing machine is rocked during the honing cycle. The amount of crown is selective and controlled by a precision cam mechanism. Taper honing can also be performed by adjusting the angular table setting. The production rate at which honing operations can be carried out depends on the pitch diameter and the face width. A gear 1-in. diameter by 1-in. wide can be honed in about 15-seconds. A gear 24-in. diameter by 3-in. wide will require about 10-minutes to hone. Of course, honing of salvage gears requires longer cycles. Stock removal with honing ranges from 0.0005 to 0.002-in. measured over pins. Honing tools are usually throw-away types that are discarded at the end of their useful life. It is not unusual for a tool to hone from 5,000 to 8,000 pinions in production operations. The honing tool teeth are thinned as the tool wears. This tooth thickness reduction can continue until root or fillet interference occurs with the work gear. Then the honing tool O.D. is reduced by a dressing tool. Eventually, the thinning of the hone teeth results in root interference with the work gear O.D., at which time the hone is considered to have ended its useful life. In some cases the hone root diameter can be re-cut ("gummed-out") with a grinding wheel in the toolroom to provide additional tool life. Gear manufacturers who make shaved hardened gears in medium or large production quantities face two problems that affect sound operating level and general gear quality. The first problem is nicks and burrs, and t he second is heat treatment distortion. The most effective way to solved this problem is to put all hardened gears through a honing operation to completely eliminate all teardown, sound testing and nick removal operations, One truck transmission manufacturer cut costs 35-percent by total honing. In other gear production operations where nicking and distortion are closely controlled, only gears that have nicks and distortion problems are honed to meet the general gear quality level. 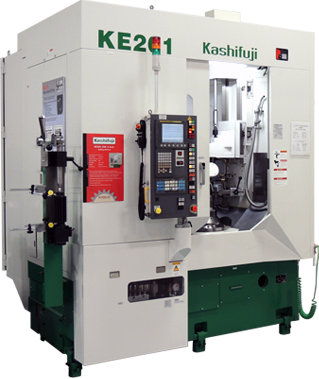 Shaved hardened gears have tooth surface finished in the 25 to 40-mu range, while honed hardened gears are in the 8 to 14-mu range. 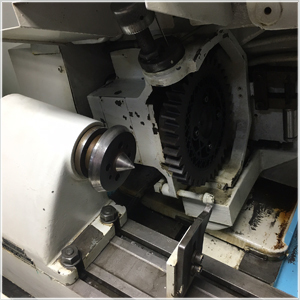 Honing will always improve the sound level and surface finish quality of shaved hardened gears. In the aerospace industry, gear are traditionally operated at high speeds under heavy loads. They are usually cut, heat-treated and ground to provide tooth surfaces (usually of sophisticated modified forms) of the highest order of accuracy. However, tests with exotic surface measuring equipment have shown that ground surfaces have a jagged, wavy profile that will not support heavy loads or wear long unless costly break-in procedures are carried out. Ground tooth surfaces usually have a surface finish in the 16 to 32-my range. Honing with Red Ring Type GAA honing tools can bring this surface finish down to the 8 to 10-mu range. In one 39-tooth, 5-D.P., 20-deg. P.A., 7.800-in. P.D. spur helicopter drive gear; honing of the gear teeth down to 8-mu surface finish increased wear life by 1,000-percent and increased load carrying capacity by 30-percent. Other tests by the gearing industry have show 100-percent load carrying capacity increases by honing ground gears. SURFACE FINISH IMPROVEMENT (10,000X) provided by honing a ground 30-tooth, 5-D.P., 25° pressure angle, 6-in. P.D., 2-in wide spur helicopter drive gear.